We pride ourselves on the quality of our First Aid training and of our trainers. We want attendees to learn lifesaving skills but in a fun and memorable way. Our range of training courses has been expanding with the recent addition of our 12 hour comprehensive training, and our re-launched Electrical Workers refresher course. You can now complete your First Aid Training during the weekend with the introduction of monthly Saturday courses which began on March 2nd. Our next course will be on Saturday April 6. To be able to provide a First Aid response to emergency situations, it is essential to have your team trained in First Aid. Refresher First Aid Courses make this even easier. Our Workplace Lifesaver Specials are a great way to bring your teams First Aid skills up to scratch at a reduced price. We offer Workplace Lifesaver Specials for numerous reasons, like when there’s a short week due to a public holiday. Whatever the reason, the Lifesaver Special is our Workplace First Aid course at $99, rather than the usual $154. Lifesaver Specials are exactly the same as our regular Workplace First Aid courses – the same duration of 8 hours, the same content and quality of course delivery, and you get the exact same qualification. Just at a reduced price! To help ease you back in to 2018 we have a plenty of Lifesaver Specials occurring in January and February, just click on the Book Now link below. Subscribe to our Training Calendar here so you can be kept up to date with the latest First Aid Training dates, including upcoming Lifesaver specials. To subscribe, sign up for our Newsletter here. To book yourself a Lifesaver Special, click the book now link below. Our fantastic First Aid trainers were on 1 News last night, showcasing our brand new Psychological First Aid course. Last week was Mental Health Awareness week, and on Friday we launched our first Psychological First Aid course. The feedback from attendees was fantastic, and 1 News wanted to get the scoop! We’re extremely proud of this new product, and we believe this will be a great addition to our workplace services. “I guarantee that most people would walk past someone that had a mental illness, I’ve avoided it for a long time,” course trainee Bruce Gray said. Course instructor Rick Eisenhart says “If somebody needs help, we’re going to help. So why can’t we do this for somebody that has hurt on the inside? Psychological First Aid is a 4 hour course designed to help prepare learners to respond to a person who may be experiencing emotional distress in the workplace. Mental Illness is common, with 1 in 5 New Zealanders experiencing some form of mental distress during their lifetime. This course is designed to give a platform for discussion to help break down stigmas around psychological distress and mental health. To book a public course, head to our booking site. For group courses or to learn more about Psychological First Aid, call us on 0800 487 439 or email enquiries@triex.co.nz. Spring is here and summer is just around the corner. With above average temperatures across NZ being predicted for this summer, it’s sure to be a hot one. If you’re heading outdoors it might be a good idea to break out the SPF30+ and remember to keep well hydrated. Also be on the lookout for bees and wasps. Honey bees and bumble bees only sting if provoked, while wasps can be aggressive and can sting more than once. With spring underway, and summer hot on our heels, we might make use of the great weather and dust off the BBQ tongs. It’s silly season, with lots of laughing, eating and drinking, so be careful not to choke! A partial airway obstruction is where the victim can still cough, breathe and speak. Encourage them to cough and keep monitoring their breathing, call 111 if you are concerned about their breathing or if the coughing does not dislodge the object. Stand at right angles to them, hold their shoulder and deliver up to five back blows with the heel of your hand, between the shoulder blades. If the back blows are unsuccessful there is a lot more that you can do. 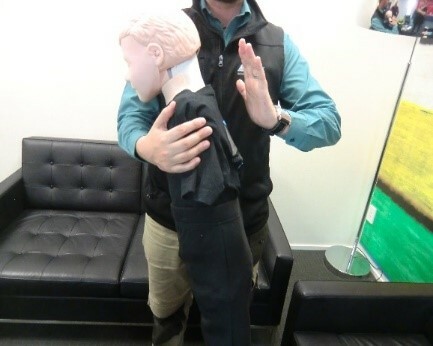 Stand behind the victim, place the thumb side of your fist in the middle of their chest. Place your other hand on top of your fist and deliver up to 5 chest thrusts, pulling straight back towards you. Complete this cycle until the object is released or until the victim becomes unconscious. If they do become unconscious, start your DRSABCD process. Prevention is better than cure, so remember to chew your food. Children can choke on food easily due to their biting, chewing and food-grinding skills still being developed. alter the food texture – grate, cook, finely chop or mash the food. remove the high risk parts of the food – peel off the skin, or remove the strong fibres. avoid giving small hard foods, such as whole nuts and large seeds, until children are at least five years old. Do you want to join the TriEx team? We are currently seeking an enthusiastic, knowledgeable and dedicated full time First Aid Trainer to join our growing team. TriEx First Aid Training is conducted either at our modern premises or onsite at our customer’s premises. Some Saturday training is required and you must be prepared to travel within New Zealand if required. This role offers a competitive salary, strong management and collegial support, social events and much more. NEW public child and infant first aid course! Monday 17th March – 4 hour child and infant first aid course for only $65.00 per attendee. Ideal first aid course for parents, grandparents, babysitters, caregivers etc – see here for more information or to book your spot on our course.